The next request for USGS data is expected in approximately 4 minutes from when this page was loaded. 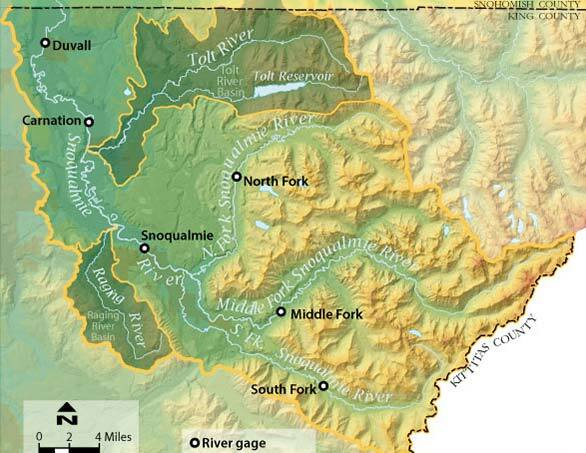 The flood phases of the Snoqualmie River are based on the sum of flow for the North, Middle and South forks. The sum of the forks represents the most recent flows available from three independent gages providing the best available flood warning information. If a gage has an older sampling time than others, its most recent measurement is used in calculating the sum of the forks. Flood phases remain in effect after flows decrease below designated thresholds until the river crests at the Carnation gage. Snoqualmie River near Carnation real-time provisional data greater than 9,000 cfs (gage heights greater than about 50 ft) are not reliable due to unsteady flow conditions during high flows. Under these conditions, a loop stage-discharge rating exists such that the true discharge is generally greater than indicated on a rising hydrograph and less than indicated on a falling hydrograph. Corrections are applied following a high-flow event but data remain provisional until approved. 2 12,000 c.f.s. Lowland flooding Neal Rd, SE Reinig Rd, West Snoqualmie River Rd NE (Walker Rd) Snoqualmie Meadowbrook Rd, Mill Pond Rd. 3 20,000 c.f.s. Flooding of varied depths occurs in the entire Snoqualmie Valley Fall City -Carnation Rd, Tolt Hill Rd, NE 124th St.